When it comes to finding the right outerwear, you need some options. The parka you throw on to walk the dog this is not. 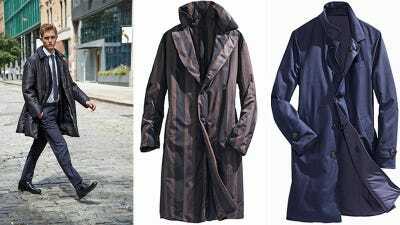 What’s great about technical pieces of late is that designers are taking them seriously as a substitute for traditional overcoats. Consider the slate-grey canvas version by Hermès. It’s slick enough to wear over a suit or with a pair of jeans, but it doesn’t look like a slicker. 1. Coat ($US4,450) by Hermès. Shirt ($US460) by Tom Ford. Shirt ($US275) by Eidos. Pants ($US870) by Brunello Cucinelli. Boots ($US995) by Dries Van Noten. 2. 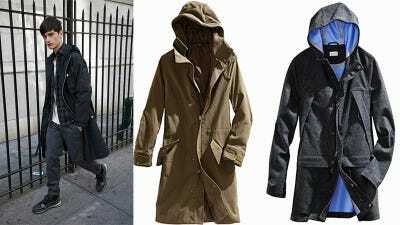 Margiela’s minimalist nod to the original fishtail was designed in 1951 to keep American soldiers warm during the Korean War. Maison Martin Margiela ($US2,685). 3. A classic silhouette lends a heritage vibe, while taped seams and a bonded-nylon lining make this wool version as modern as ever. Club Monaco ($US625). Go ahead and wear a puffy coat over a suit — as long as it’s as aesthetically pleasing as the Balenciaga iteration shown here (left). Besides its hidden magnetic closures (which are pretty cool), what sets this puffer apart from its athletic, cropped cousins is a streamlined silhouette that reads more office-friendly than ski-lift-ready. Nicholas Prakas1. 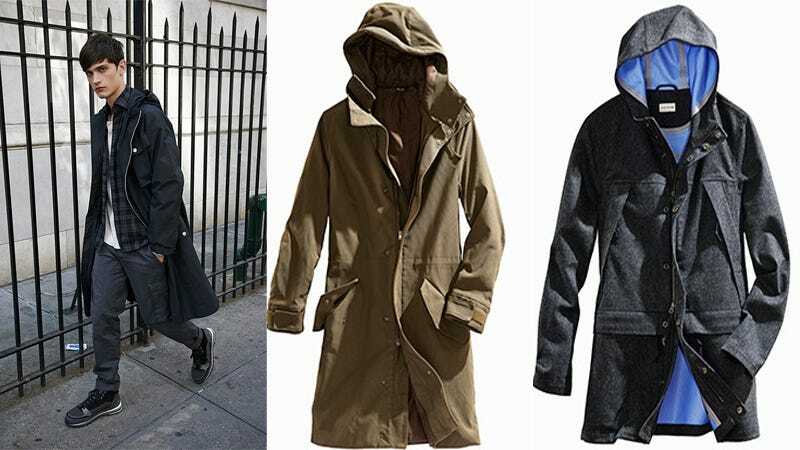 Coat ($US2,295) by Balenciaga. Suit ($US1,295) by BOSS. Shirt ($US290) by Michael Tapia. Tie ($US285) by Brunello Cucinelli. Belt ($US310) by Prada. Shoes ($US760) by Dior Homme. Socks ($US9) by Gold Toe. 2. A bold stripe doesn’t come off as brash when it’s done in muted colours. Think of it as a patterned coat for pattern-phobes. Z Zegna ($US2,915). 3. Cut like a mac and reversible (one side is wool, the other water-resistant nylon), this navy number is timeless. Brunello Cucinelli ($US3,115). Why lose a layer when you’re trying to keep warm? Because the soft-shouldered construction of an unlined coat, a hallmark of Neapolitan tailoring, is the epitome of relaxed elegance. We especially like Burberry’s modern interpretation of the caban coat seen here: The double-faced cashmere protects against the chill while the generous cut offers room to move. Nicholas Prakas1. 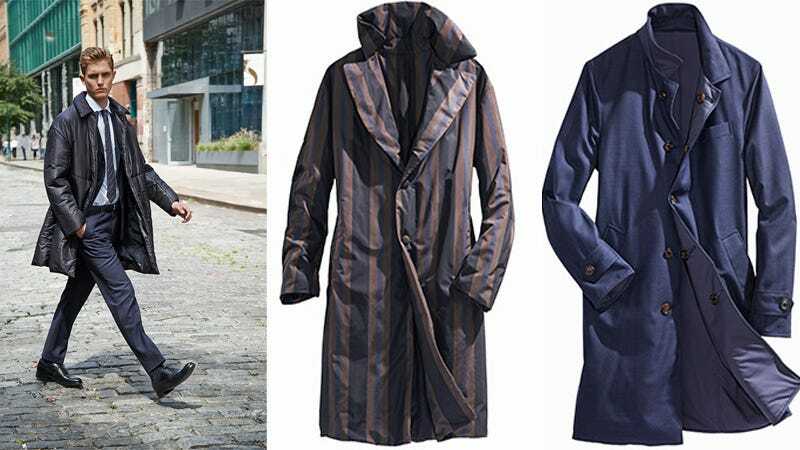 Coat ($US4,195) by Burberry Prorsum. Sweater ($US750) by Belstaff. Jeans ($US295) by Levi’s Vintage Clothing. Sneakers ($US425) by Bally. Socks ($US9) by Gold Toe. 2. Skip the buttons and embrace this robelike coat on days you’d really rather be at home on the couch. Valentino ($US2,250) 3. 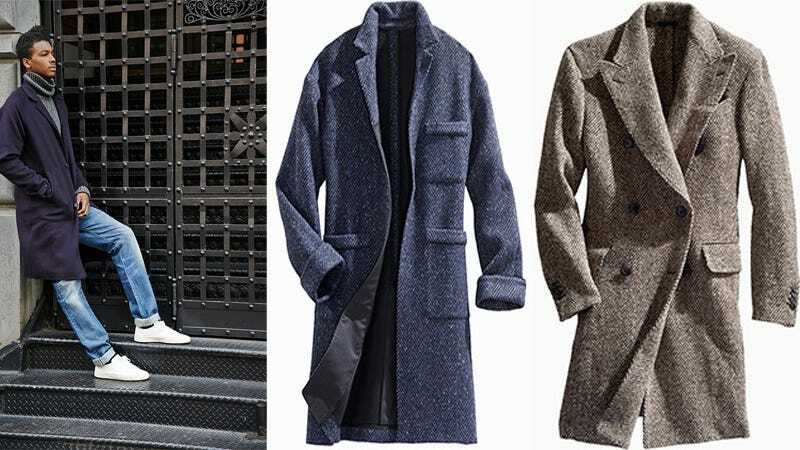 A double-breasted topcoat in a herringbone pattern will perpetually read well-dressed. Eidos ($US1,595).